Definition at line 33 of file MapBuilder.h. Called by start() before the doStart(), allows superclasses to do some initialization startup preceeding subclass customization. Calling this signals the behavior to stop running. In turn, this calls doStop(), then removes the behavior from the registry and subtracts from the reference counter Ñ thus may delete the object if no other references remain. Gives a short description of what this particular instantiation does (in case a more specific description is needed on an individual basis). 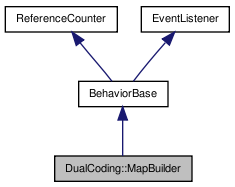 Execute a MapBuilder request, and optionally store the request id in a variable; the id will be returned in any case. Execture a MapBuilder request and store the address of the requesting behavior to use as the source ID in a mapbuilder status event. Delegate function for event processing, the event itself is pointed to (only for the duration of the doEvent() call!) by event. Returns true if it has set up a valid next gaze point in nextGazePoint. Returns true if there is a shape which needs be looked at again and is reachable; sets it up as nextGazePoint. Find the next valid gazepoint in the queue, converting to egocentric if necessary. Starts robot moving to the next gaze point. Control whether static structures (mapbuilder, sketchGUI sockets, etc.) are retained. Triggers action to execute the request at the front of the queue. Sets agent location and heading, and recomputes local-to-world transformation matrices. Called by the Pilot. Definition at line 53 of file MapBuilder.h. Definition at line 46 of file MapBuilder.cc. Definition at line 121 of file MapBuilder.h. Definition at line 682 of file MapBuilder.cc. Definition at line 355 of file MapBuilder.cc. Definition at line 287 of file MapBuilder.cc. Definition at line 264 of file MapBuilder.cc. Referenced by doEvent(), and executeRequest(). Default implementation watches for 'private' text message events (those forwarded by a BehaviorSwitchControl from ControllerGUI input) and will publically rebroadcast them. The idea is that your own processEvent gets first dibs, but if the behavior doesn't handle the text message, it will be handed off for others. Definition at line 184 of file MapBuilder.cc. Definition at line 390 of file MapBuilder.cc. Definition at line 103 of file MapBuilder.cc. Definition at line 109 of file MapBuilder.cc. Definition at line 124 of file MapBuilder.cc. Referenced by executeRequest(), and requestComplete(). Definition at line 453 of file MapBuilder.cc. Definition at line 464 of file MapBuilder.cc. Definition at line 613 of file MapBuilder.cc. Definition at line 142 of file MapBuilder.h. Definition at line 1631 of file MapBuilder.cc. Definition at line 1383 of file MapBuilder.cc. Definition at line 1257 of file MapBuilder.cc. Definition at line 1241 of file MapBuilder.cc. Definition at line 1554 of file MapBuilder.cc. Definition at line 1170 of file MapBuilder.cc. Definition at line 1400 of file MapBuilder.cc. Definition at line 1101 of file MapBuilder.cc. Definition at line 1041 of file MapBuilder.cc. Definition at line 1073 of file MapBuilder.cc. Definition at line 1313 of file MapBuilder.cc. Definition at line 1534 of file MapBuilder.cc. Definition at line 1120 of file MapBuilder.cc. Definition at line 1344 of file MapBuilder.cc. Definition at line 1153 of file MapBuilder.cc. Definition at line 1277 of file MapBuilder.cc. Definition at line 1197 of file MapBuilder.cc. Definition at line 129 of file MapBuilder.h. This means that getDescription called on a pointer to a BehaviorBase of unknown subtype would always return an empty string, which is pretty useless. So instead we return the name in this situation. If you want getDescription to return getClassDescription, you'll have to override it in your subclass to do so. Definition at line 124 of file MapBuilder.h. Definition at line 148 of file MapBuilder.h. Definition at line 421 of file MapBuilder.cc. Definition at line 535 of file MapBuilder.cc. Definition at line 529 of file MapBuilder.cc. Definition at line 283 of file MapBuilder.h. Definition at line 541 of file MapBuilder.cc. Definition at line 396 of file MapBuilder.cc. Definition at line 557 of file MapBuilder.cc. Referenced by isShapeVisible(), and removeNoise(). Definition at line 547 of file MapBuilder.cc. Referenced by isShapeVisible(), and removeGazePts(). Definition at line 51 of file MapBuilder.h. Definition at line 593 of file MapBuilder.cc. Definition at line 727 of file MapBuilder.cc. Referenced by extendLocal(), extendWorld(), and importLocalToWorld(). Definition at line 519 of file MapBuilder.cc. Definition at line 374 of file MapBuilder.cc. Definition at line 1372 of file MapBuilder.cc. For robustness to future change, subclasses should be sure to call the superclass implementation. Definition at line 62 of file MapBuilder.cc. Definition at line 1013 of file MapBuilder.cc. Definition at line 225 of file MapBuilder.cc. Referenced by doEvent(), and grabCameraImageAndGo(). Definition at line 708 of file MapBuilder.cc. Definition at line 712 of file MapBuilder.cc. Definition at line 991 of file MapBuilder.cc. Definition at line 895 of file MapBuilder.cc. Referenced by extendLocal(), and extendWorld(). Definition at line 480 of file MapBuilder.cc. Referenced by doEvent(), executeRequest(), grabCameraImageAndGo(), and setInitialGazePts(). Definition at line 473 of file MapBuilder.cc. Definition at line 1639 of file MapBuilder.cc. Definition at line 439 of file MapBuilder.cc. Definition at line 500 of file MapBuilder.cc. Definition at line 943 of file MapBuilder.cc. Definition at line 50 of file MapBuilder.h. Definition at line 78 of file MapBuilder.h. You shouldn't override this — override doStop instead. Definition at line 93 of file MapBuilder.cc. Definition at line 409 of file MapBuilder.cc. Referenced by executeRequest(), and moveToNextGazePoint(). const std::string & modelName = "model1"
Definition at line 1656 of file MapBuilder.cc. Definition at line 1650 of file MapBuilder.cc. Definition at line 82 of file MapBuilder.h. Definition at line 85 of file MapBuilder.h. Definition at line 84 of file MapBuilder.h. Referenced by determineNextGazePoint(), filterGroundShapes(), getCamCrosses(), getCamDominoes(), isLineVisible(), isShapeVisible(), matchSrcToDst(), printShS(), and setInitialGazePts(). Definition at line 81 of file MapBuilder.h. Definition at line 83 of file MapBuilder.h. Definition at line 95 of file MapBuilder.h. Referenced by determineNextGazePoint(), executeRequest(), filterGroundShapes(), isBadGazePoint(), and preStart(). Definition at line 36 of file MapBuilder.h. Referenced by executeRequest(), getShapes(), preStart(), and processImage(). Definition at line 35 of file MapBuilder.h. Referenced by executeRequest(), preStart(), and processImage(). Definition at line 98 of file MapBuilder.h. Referenced by calculateGroundPlane(), determineNextGazePoint(), doEvent(), doNextSearch(), executeRequest(), extendLocal(), extendWorld(), filterGroundShapes(), getCamAgents(), getCamAprilTags(), getCamBlobs(), getCamCrosses(), getCamCylinders(), getCamDominoes(), getCamEllipses(), getCameraShapes(), getCamLines(), getCamMarkers(), getCamNaughts(), getCamPolygons(), getCamSiftObjects(), getCamSpheres(), getCamTargets(), getCamWalls(), getCurrentRequest(), matchSrcToDst(), moveToNextGazePoint(), processImage(), removeGazePts(), removeNoise(), requestComplete(), requestExitTest(), scanForGazePts(), setAgent(), setInitialGazePts(), stop(), and storeImage(). Definition at line 44 of file MapBuilder.h. Referenced by calculateGroundPlane(), getCamCylinders(), projectToGround(), and projectToLocal(). Referenced by extendLocal(), filterGroundShapes(), getShapes(), preStart(), and projectToLocal(). Definition at line 99 of file MapBuilder.h. Definition at line 38 of file MapBuilder.h. Referenced by determineNextGazePoint(), executeRequest(), extendLocal(), extendWorld(), getCamCrosses(), getCamDominoes(), importLocalToWorld(), importWorldToLocal(), preStart(), and projectToLocal(). Definition at line 37 of file MapBuilder.h. Referenced by executeRequest(), and preStart(). Definition at line 91 of file MapBuilder.h. Referenced by determineNextGazePoint(), extendWorld(), importLocalShapeToWorld(), importLocalToWorld(), and setAgent(). Definition at line 100 of file MapBuilder.h. Referenced by executeRequest(), filterGroundShapes(), isBadGazePoint(), removeGazePts(), and removeNoise(). Definition at line 72 of file MapBuilder.h. Definition at line 57 of file MapBuilder.h. Definition at line 58 of file MapBuilder.h. Definition at line 70 of file MapBuilder.h. Definition at line 55 of file MapBuilder.h. Definition at line 56 of file MapBuilder.h. Definition at line 59 of file MapBuilder.h. Definition at line 63 of file MapBuilder.h. Definition at line 65 of file MapBuilder.h. Definition at line 60 of file MapBuilder.h. Definition at line 66 of file MapBuilder.h. Referenced by filterGroundShapes(), and matchSrcToDst(). Definition at line 64 of file MapBuilder.h. Definition at line 71 of file MapBuilder.h. Definition at line 67 of file MapBuilder.h. Definition at line 61 of file MapBuilder.h. Referenced by getCamAgents(), getCamBlobs(), getCamCrosses(), getCamCylinders(), getCamDominoes(), getCamEllipses(), getCamLines(), getCamMarkers(), getCamNaughts(), getCamPolygons(), getCamSpheres(), getCamTargets(), and getCamWalls(). Definition at line 62 of file MapBuilder.h. Referenced by getCamBlobs(), getCamCylinders(), getCamDominoes(), getCamEllipses(), getCamLines(), getCamMarkers(), getCamNaughts(), getCamPolygons(), getCamSiftObjects(), getCamSpheres(), getCamTargets(), and getCamWalls(). Definition at line 68 of file MapBuilder.h. Definition at line 69 of file MapBuilder.h. Definition at line 73 of file MapBuilder.h. Definition at line 54 of file MapBuilder.h. Definition at line 104 of file MapBuilder.h. Referenced by determineNextGazePoint(), moveToNextGazePoint(), removeGazePts(), and storeImage(). Definition at line 103 of file MapBuilder.h. Referenced by doEvent(), doNextSearch(), grabCameraImageAndGo(), and storeImage(). Definition at line 97 of file MapBuilder.h. Referenced by executeRequest(), requestComplete(), and stop(). Definition at line 46 of file MapBuilder.h. Referenced by isRetained(), and setRetain(). Referenced by doEvent(), and scanForGazePts(). Definition at line 101 of file MapBuilder.h. Referenced by getCamSiftObjects(), newSiftMatcher(), saveSiftDatabase(), and trainSiftObject(). Definition at line 87 of file MapBuilder.h. Referenced by getAgent(), moveAgent(), and setAgent(). Definition at line 76 of file MapBuilder.h. Referenced by executeRequest(), preStart(), setAgent(), and setVerbosity(). Definition at line 40 of file MapBuilder.h. Referenced by determineNextGazePoint(), executeRequest(), extendWorld(), importLocalShapeToWorld(), importLocalToWorld(), and preStart(). Definition at line 39 of file MapBuilder.h. Referenced by determineNextGazePoint(), extendWorld(), importLocalToWorld(), importWorldToLocal(), and setAgent(). Definition at line 42 of file MapBuilder.h.